Martin Bielik research assistant and at the Faculty of Architecture and Urbanism, Bauhaus-Universität Weimar – Germany (Prof. Dr. Dirk Donath, Chair of Computer Science in Architecture) and co-founder of DecodingSpaces GbR. He graduated in architecture and urban planning in 2011 at the Faculty of Architecture, Slovak University of Technology. Since 2012, he worked as lecturer and researcher at the Bauhaus University Weimar. His main research interest is computational analysis and simulation of urban systems and application of these methods in planning process. As associate investigator at Emerging Cities Lab in Addis Ababa (2016), he positions his research in context of rapid urbanization. After studying architecture and urban planning in Munich and Kaiserslautern Reinhard König completed his PhD thesis in 2009 at the University of Karlsruhe. From 2007 - 2012 Dr. König has worked as a research assistant and appointed Interim Professor of the Chair for Computer Science in Architecture at Bauhaus-University Weimar. From 2013 - 2016 Reinhard König worked as senior researcher at the Chair of Information Architecture, ETH Zurich. In 2014 Dr. König was guest professor at the Technical University Munich and was appointed to the Junior-Professor for Computational Architecture at Bauhaus-University Weimar in 2015. From 2016 he is a Principal Scientist at Smart and Resilient Cities unit at the Austrian Institute of Technology (AIT) in Vienna. In addition, he acts as Co-PI in the Big Data Informed Urban Design group at the Future Cities Lab at the Singapore ETH Centre. Katja Knecht is a researcher in Cognitive Design Computing within the Big Data-Informed Urban Design and Governance project at the ETH Future Cities Laboratory Singapore (FCL). With an interdisciplinary background in media, architecture, and computing, her work has ranged in the past from the development of generative and media based tools to support architectural and urban design processes to the creation of wearable devices and tangible user interfaces for mediated spatial experiences. Her current research focusses on the human-centred design and development of next generation computational urban design support. In specific, her work addresses defining and designing the dialog between designer and machine and ensuring the usability and usefulness of the tools in the urban design and planning context. Vignesh Kaushik is an Architect focusing on the use of Computational Design, Building Performance & BIM to deliver Design Technology services to companies in the AEC Industry. 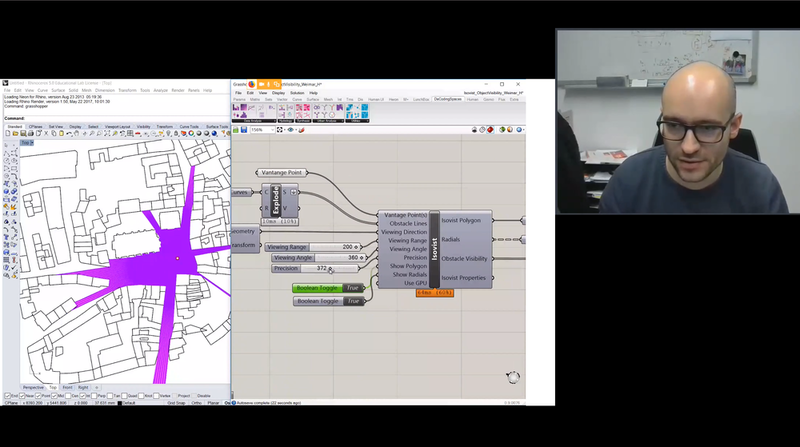 In this webinar, you’ll learn how to perform quantitative analysis of urban space using various components from the DeCodingSpaces Toolkit for Rhino/GH on a real-life project. You’ll learn how to analyse Street Networks effectively to compute real life phenomena such as the distribution of functions in a city or the movement patterns of citizens. Finally, you’ll also be introduced to the various methods for the synthesis of urban morphology (street networks, plots, and buildings) and how they connect to the analysis methods. The DeCodingSpaces-Toolbox for Grasshopper is a collection of analytical and generative components for algorithmic architectural and urban planning. The toolbox is free software released by the Computational Planning Group (CPlan) and is a result of long term collaboration between academic institutions and praxis partners across the globe with the common goal to increase the efficiency and quality of architecture and urban planning. It integrates established urban analysis methods, extend them with new features and introduces new methods for the analysis and synthesis of urban morphology. TGIC is a community-driven platform providing concise technology education that allows students and professionals to learn at their own pace and stay up-to-date.